I am not a big sci-fi reader. At all. I like my sci-fi movies, but for some reason I never pick up the genre in book form. 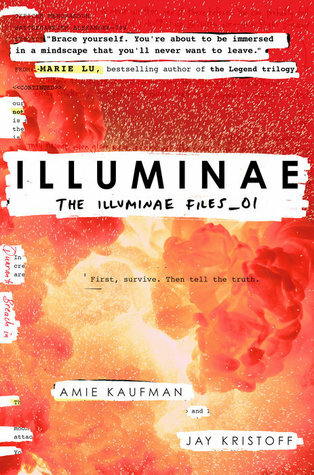 With all of the hype surrounding Illuminae, though, I finally decided to grab a copy and see what it was all about. The day Kady and Ezra break up, their world falls apart. Literally. Their tiny planet becomes victim to a deadly attack and Kady and Ezra find themselves helping each other just to survive. They find their way to an evacuating fleet, taking them to space ships that will bring them to safety. Little do they know, the attack on their planet was much more deadly than anyone could have dreamed and they find themselves trying to survive a different kind of attack before it's too late for anyone. When I started this book, I was reminded why I don't read sci-fi: The immense amount of information. I find complex books hard to keep straight and I was a bit lost in the technical information given to us at the beginning of this book. But when we got into the story, I settled into the flow of the story and started to really understand the characters and fall in love with them. Even though this book is only written in files, emails, messages, maps, and other forms, I felt like I got a really good sense of the characters, a sense of urgency, and a sense of suspense. There were so many dimensions to this story and it was so engaging. Even though this was 599 pages, I flew through it. But let's get to the real reason I loved this book. The romance! This centers around Kady and Ezra and how they broke up on the day of the attacks. Being the victim of an attack really makes you rethink your life and Kady and Ezra realize that they really do miss each other. Too bad they end up on completely separate ships. I loved how we still got their whit and humor through their messages, as well as their desperation to be with each other. Their characters were so headstrong and so determined to make sure the other was safe and alive. While this book was definitely out of my comfort zone, I loved every second of it. I loved the action and was surprised by how much death was involved in this book. I felt like I was watching my favorite sci-fi movies (I, Robot or Guardians of the Galaxy anyone?) and I had no idea how the characters were going to get out of their situation. There were so many twists and turns and I had no idea how this book was going to end. I cannot wait to pick up Gemina and see what happens to these characters and the crazy web they wove themselves!